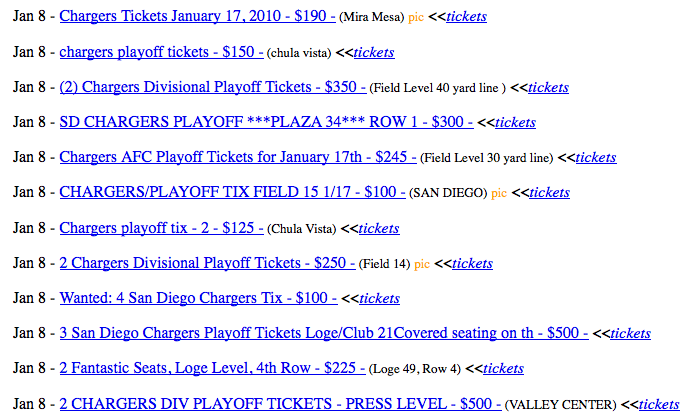 If you want Chargers Playoffs tickets, you don’t have to buy 2010 Season Tickets, you just have to go to Craig’s List and overpay for some other season ticket holder’s tickets. The Chargers sold up to 8 playoff tickets per Season Ticket Holder, which leaves no tickets for the Average Joe at face value left to buy from the ticket office directly. I love the Chargers, but this policy is FUCKED! Previous PostA New Stadium For SD? Not so fast!Next PostManning’s 4th MVP is Good for The Bolts!